Backpacks are my favorite type of travel bag. Comfortable to wear and roomy inside, I almost always choose a backpack over other types of bags when I travel. The only issue is I can’t see what is going on behind me when I have it on my back. As a traveler, one of the biggest challenges is keeping your valuables safe. Whether you are waiting in an airport, on a train station, walking through a busy street, or sitting at a restaurant, you want to be confident your belongings and valuables are safe and secure. We were in the market for a new travel daypack and decided to take a look at the range of anti theft travel gear available. If you travel regularly or commute to work or school, a theft proof bag is a wise choice. They give you a greater sense of security your gear is safely stowed away. It is good to know what anti-theft features make a difference, so we have put together this guide to help you choose between the best anti theft backpacks for travel. Don’t let a pickpocket ruin your vacation – take a look at our top anti theft backpack below or read on to find the best anti-theft backpacks for you. 3 What is an Anti Theft Backpack? 10 Are Anti Theft Backpacks Worth The Money? The Pacsafe Metrosafe is our top pick for the most secure backpack. We think it has the best combination of anti-theft features, style, size and functionality of all the best anti theft bags on our list. Complete with a modern look, it is perfect for travel and everyday commuting. Click here to see the best anti theft backpack for travel. We have researched the market to help you choose the best anti theft bag. The best anti-theft backpacks are summarised below for easy reference. Whether you are looking for the best men’s anti theft bag or an anti theft women’s backpack, we think you will find a great option on our list. This table will help you compare the anti theft bag brands side by side. Sort the table by clicking on any of the headers. The anti theft backpack reviews are below. 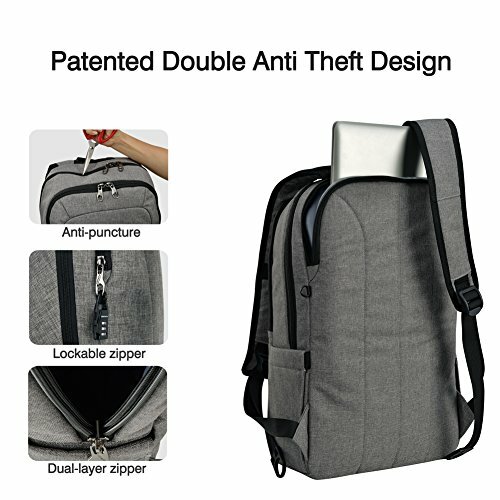 What is an Anti Theft Backpack? Unlike regular travel bags, theft proof luggage has been specifically designed to help protect your belongings when you travel. Secure travel bags have unique design features such as slash proof materials, hidden pockets and stronger zippers. These features help reduce the risk of thieves accessing and stealing your valuables. 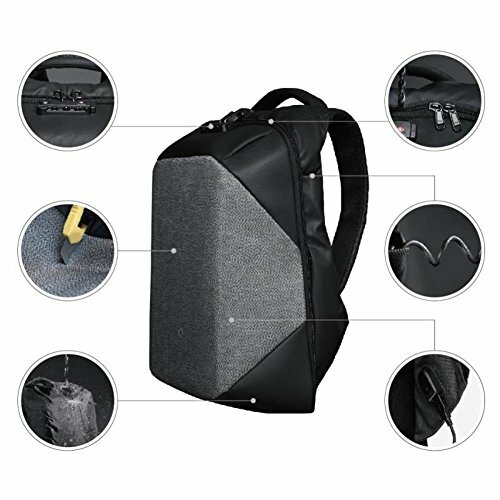 The best anti theft travel backpack will give you peace of mind that no matter where you are, your passport, credit cards, camera and other valuable belongings are safely stored. There are a number of different anti theft features in travel backpacks. Not all travel safe bags have all these features, so we have listed the key anti theft features below to help you decide which features are most important to you. 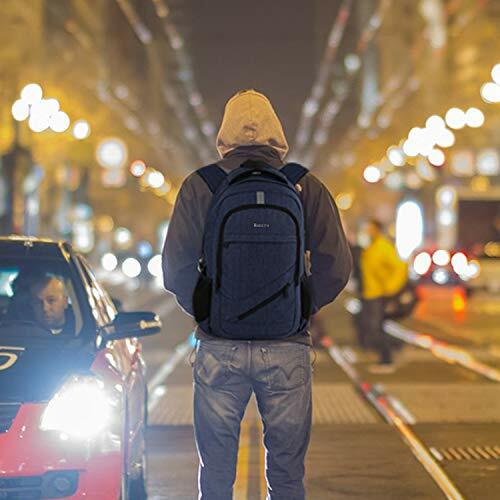 If you already know what features you are looking for, you can skip straight to our anti theft backpack reviews by clicking here. The best anti theft bags for travel have slashproof steel mesh embedded within the fabric of the bag. This prevents the fabric being cut open to access your bag. Most Pacsafe travel bags and some Travelon anti theft bags have this design feature. The steel wire mesh not only protects your belongings from opportunist thieves when you are on crowded trains or in busy markets. It also prevents unwarranted access when you leave the bag in your hotel or with the concierge. Some slash proof travel bags also have slashproof straps. This is an extra security feature to prevent your bag being stolen when it has been locked to a table or chair. Backpacks with lockable zippers are one of the best deterrents to prying eyes. Some will have the backpack zipper locks on the main compartment. The best anti theft travel bags will have a lockable zipper on every section. The design of travel bag locks will differ between each lockable backpack. Some require a separate padlock or recommend you use TSA approved luggage locks. Others have unique zipper lock designs. Lockable zippers won’t prevent a determined thief with time on their hands trying to access your bag. They are most effective when out exploring as they prevent opportunists accessing your bag when you are not looking. Note that some backpacks with locks will simply have a ring to hook the zipper to, instead of a physical lock. While a lock is a superior solution, a zipper that is hooked to a D ring will usually be sufficient to deter thieves from trying to access your bag. 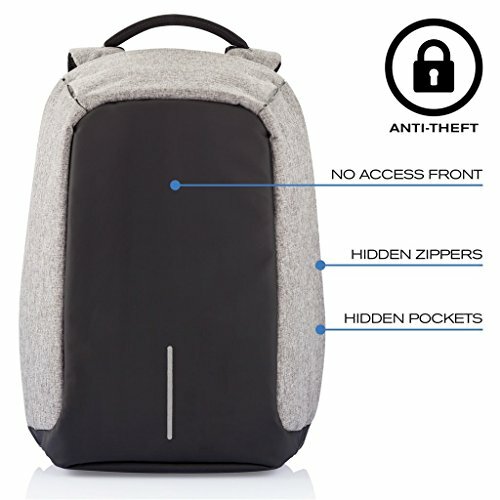 Continuing on the zipper theme, a hidden zipper backpack makes it hard for thieves to access your bag. The zippers to the main compartment are hidden at the rear of the bag when it is resting against your back. Many new anti theft travel bags have this feature and in fact for some travel safe bags this is the only anti theft security feature. If you are looking for a simple (and cheaper) theft proof bag option, a backpack with hidden zippers is a good choice. Secret compartments and hidden pockets are perhaps the most common anti theft feature on backpacks advertised as theft proof travel bags. A hidden pocket is are often tucked away at the rear of the backpack where it is more difficult to access when you are wearing the backpack. These hidden pockets are good places to store your passport, wallet, credit cards and mobile phone. Some travel secure backpacks will also have zippered pockets deep inside the bag. This is another common anti theft feature. A secure travel backpack shouldn’t only ward off thieves. It should also protect your expensive tech gear from water damage if you get caught in a downpour when traveling. An anti theft waterproof backpack may have an integrated bag cover to pull over the outside of the bag. Other anti theft bag brands will use water resistant materials. Note few brands claim to have a fully waterproof theft proof backpack. Most are water resistant. So if waterproofing is important, ensure you check the details. A separate cover is the best option. A travel safe backpack will often include an RFID blocking card. While there is debate about the extent of RFID fraud, many brands include RFID blocking material in an anti theft daypack. RFID anti theft bags typically have an internal pocket lined with RFID blocking fabric which prevents radio waves skimming your credit card and passport data. For ultimate peace of mind, some anti theft backpacks for travel will include a locking cable to tie the bag to a table, chair, post etc. Some are integrated locking cables, others are separate and some anti theft bag brands even incorporate a locking feature within the backpack strap. This is a great security feature when you are waiting at a train station or at the airport and you need to secure your travel bags. Now you know all of the anti theft features available, how do you choose the top anti theft backpack for you? Here are some guidelines to help you make the best choice. Consider the anti theft features above and list which ones are most important to you. Is your main priority to find a slashproof backpack? 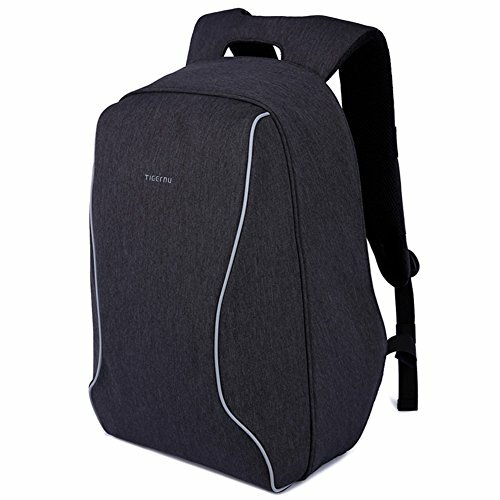 Perhaps you are looking for an RFID blocking backpack with a laptop compartment? We have included an anti theft feature summary for each bag in the backpack reviews below to help you choose. 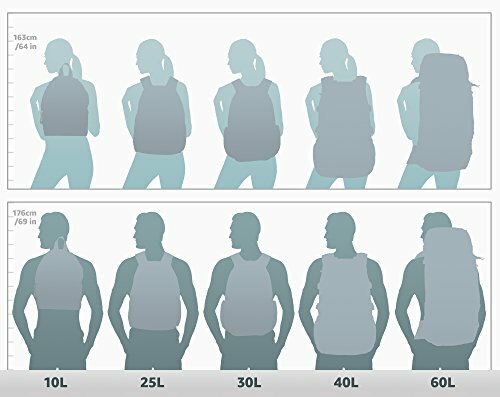 You will notice there is a wide range of theft resistant backpack sizes available. This is an important feature to consider. Are you looking for anti theft luggage for carry on, an anti theft daypack or a secure backpack for everyday? Consider what you need to fit inside your daypack and how many compartments you need. If you are a parent, you might need a larger pack to fit the kid’s drink bottles, sweaters and hats. If you are looking for the best anti theft backpack for college you will need a pack large enough to fit your laptop, books and notepad. A small anti theft backpack may be all you need if you pack light and need to carry a wallet, camera and water bottle. Also consider whether the backpack is a good fit for your height. Some travel bags are much longer than others, and may not be comfortable, especially if you are shorter than most. We list the backpack dimensions and laptop sleeve sizes in the anti theft travel bag reviews below. There are a range of colors and styles available for many anti theft backpacks. Where different colors are available we have indicated below. The anti theft backpacks also differ in how they open and can be accessed. Some of the backpacks with zips against the back open 90 or 180 degrees, others have access from the top. I don’t know about you, but I need a good number of pockets in a backpack. Trying to find your mobile phone at the bottom of a backpack is never fun. We explain the pocket layout for each bag below, but do consider whether external pockets are important to you (as some don’t have them). Comfort is always an important criteria, and this will differ depending on your height and for how long you carry the bag. Some travel backpacks use high quality foam on the back of the bag. Note the quality, shape and padding of the straps too if you carry the bag for long periods of time. We list the travel safe bag comfort features below to help you choose the best anti pickpocket bag for you. Read our detailed review and anti theft feature summary for each travel backpack here. We are confident you will find the best safe backpack for any type of trip from this list. The Pacsafe Metrosafe backpack is our top pick for the best anti theft luggage. 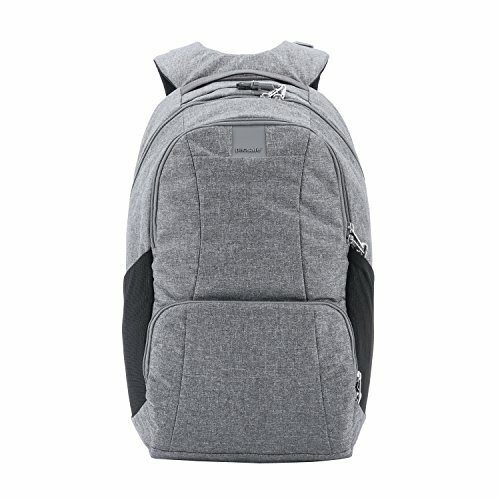 Pacsafe have an outstanding reputation for producing a high quality cut proof backpack. We think this Pacsafe anti theft backpack has the best combination of anti-theft features, style, size and functionality. It also comes with a 5 year warranty! The backpack and backpack straps are embedded with stainless steel wire and are cut proof. It is one of the few anti slash backpack options on our list. All three sections have lockable zippers using a clever locking system to keep prying hands out of your bag. The straps have turn and lock security hooks which makes it so quick and easy to lock your bag down when out at a restaurant or at a train station. The padded laptop sleeve inside fits a 15″ laptop and is suspended so your tech gear doesn’t touch the ground when your bag does. The bag has a good number of zippered internal pockets, including an RFID pocket. The side pockets are practical for carrying water bottles and an umbrella. This slash proof bag is one of the larger options at 25 liters and can easily fit a laptop, camera, sweater, phones and other bits and pieces. We love it and think it is the best Pacsafe daypack for travelers and for everyday use too. The Travelon anti theft travel bag is one of the smaller, more stylish anti theft bags. Like the Pacsafe backpack, the anti theft classic has slash proof straps and body. Both compartments have lockable zippers and there are two small side pockets (not lockable). Unlike the Pacsafe travel bags, the zippers simply attach to a d ring at the base of the zip. They can be fiddly to undo in a hurry, but are a simple pickpocket deterrent. There are plenty of internal pockets including an RFID pocket inside the two compartments. Travelon backpack reviews note the straps are slightly shorter than others, which makes it a good choice for people on the shorter side. 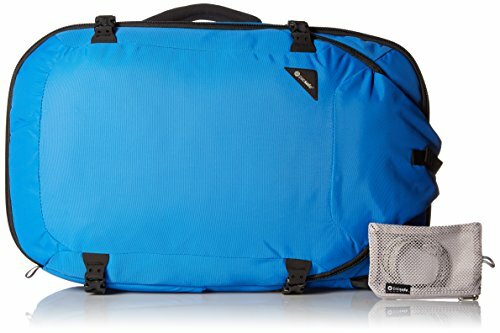 This Travelon daypack doesn’t have room for a laptop but can fit a tablet or ipad. While only 13 L in size, it is still able to fit most items you would expect to carry when out sightseeing during the day including a camera, light sweater, phone and headphones. We think this anti theft bag is a great choice for weekend city trips and for women who prefer a more stylish anti theft backpack. The XD Design backpack is a popular and modern anti theft backpack with charger. It has a simple theft proof design – hidden zippers that open from the rear of the pack. There are a number of easy access hidden external pockets to make finding your train ticket or mobile phone a breeze. It also has an integrated USB charging port to keep your phone battery topped up when you are out. Despite the boxy design, the Bobby anti theft backpack molds to your back for optimal weight distribution. The bag has a single compartment with three ways of opening – 30 degrees, 90 degrees or 180 degrees. Note some people do find it a little awkward to open and access compared to a standard travel backpack. All of the bobby backpack range use cut proof fabric and are water resistant. The Bobby XL can fit a 17″ laptop plus a small tablet. The Bobby Backpack is 15 liters and comes with a 2 year warranty. During our Bobby backpack review we also discovered the Bobby Compact Backpack. If you don’t need to fit a 17″ laptop, take a look at the very cute Bobby Compact, with fresh color options and an integrated rain cover. The Eagle Creek Travel Bug Mini Backpack is a small anti theft backpack perfect for short day hikes and sightseeing. At only 11 liters, you will fit a tablet in the padded sleeve, and it is large enough to fit a camera and other small bits and pieces in the main compartment. It has a drink bottle holder on the outside for easy access while out sightseeing. Inside the backpack there is an RFID pocket as well as other small pockets to keep organised. The unique anti theft feature on this bag are the secure-zip toggles and the central locking point to secure your bag without a lock. This system acts as a simple deterrent to would be thieves. 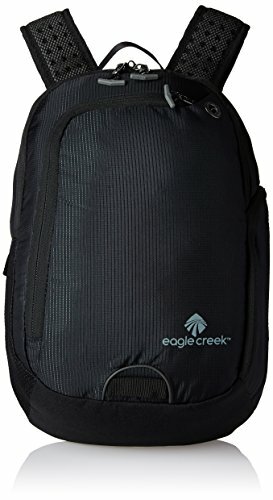 The Eagle Creek anti theft backpack is a good choice for people looking for a traditional style backpack in a smaller more compact size. The Mancro Business Laptop Backpack is a basic anti theft bag with lockable zippers and an RFID pouch. Like the Bobby, it has a built in USB charger accessible from outside the bag. There are two main compartments but note only the main compartment has a lockable zipper (which attaches to a ring on the side of the bag). There are plenty of small internal pockets to stay organised and external side pockets for a water bottle or umbrella. At 25 litres the Mancro backpack is more generous in size and will comfortably fit school books and laptop, or gear to get out and explore when traveling. Whilst the supplier advises up to 15.6″ laptops will fit, many purchasers have indicated they can fit a 17″ laptop in the sleeve. The Mancro RFID Backpack doesn’t have any of the more advanced anti theft features. But it is roomy, well priced and one of the best anti theft everyday backpack options. We think it is a good choice for the business commuter or college student. If you are looking for the best anti pickpocket backpack for travel, we think there are better options on this list. This Kopack anti theft backpack has three main compartments and an overall capacity of 20 liters. The rear hidden laptop section is tucked behind the shoulder straps for extra security and the zipper can be locked to a D ring (no lock provided). The laptop section is not suspended, and in some kopack backpack review feedback this was an issue (as your laptop does touch the bottom of the bag). The front compartment has a lot of practical small pockets, but there isn’t a d ring to lock the zips, so we wouldn’t recommend storing your passport and wallet here. Like many other travel safe bags, the Kopack laptop backpack comes with an external USB charger port to charge your phone on the go. Overall we like the slim design and hidden laptop compartment on the Kopack anti theft laptop bag. This model fits up to a 15.6″ laptop, but there is an option to select a larger design for a 17″ laptop. This Kopack backpack is not slash proof but is a good choice for local trips and daily commuters. The Pacsafe Venturesafe bags are the outdoor range of Pacsafe bags and have all the world class anti theft features we have come to expect of Pacsafe. Slash proof body and straps, lockable zippers on both the external compartments plus an RFID pocket, this is the perfect anti theft daypack for travel. It has a more sporty design and if you aren’t carrying a laptop, it is possible to store and access a water reservoir in this pack. 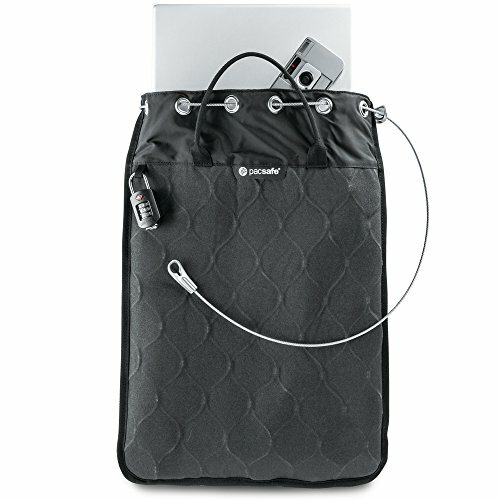 Like other Pacsafe bags, the Venturesafe has the Turn and Lock security hooks on the straps to make it easy to attach the bag to a table or chair when at the airport or a restaurant. The side pockets are handy and don’t forget about the 5 year Pacsafe warranty! This anti theft daypack has a capacity of 15 liters. You will fit a camera, laptop, water bottle in this bag but not a lot more. There is an option to choose the same bag with a 25 liter capacity if you tend to carry more stuff. This cut proof bag fits up to a 13″ laptop, but the larger bag fits a 15″ laptop. The laptop section is padded and suspended to protect your laptop when putting your bag on the ground. 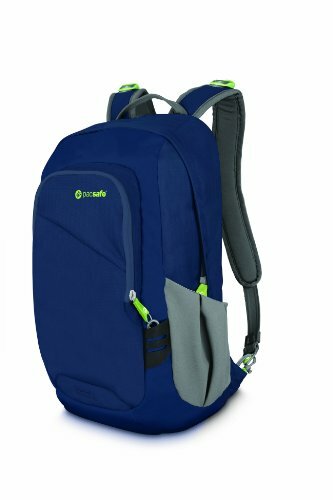 We love Pacsafe and think this is a great choice for backpackers and solo travelers looking for the best theft free backpack. Similar to the Bobby backpack, the Oscaurt backpack has hidden zippers as the primary anti theft feature. The Oscaurt has 2 handy external pockets and a secret side pocket too for storing valuables. Unlike a regular backpack it opens 180 degrees, which makes it easy to pack. But depending on how often you want to access items in the pack it may be a frustrating design for some people. There is a USB charging port for topping up your battery on the go and the fabric is water resistant too. The supplier indicates laptops up to 15.6″ can fit in the sleeve, however this would only be for super slim laptops. Most don’t fit, so we have reduced the max laptop size below based on feedback from users of the bag. This modern and stylish backpack is one of the smaller secure backpacks on this list with a capacity of just 12 liters. For this reason we think it is a good travel safe bag for short trips and business commuters, but perhaps not so great for longer trips to Europe or backpackers. This Kopack backpack with hidden back pocket is a larger design compared to the slim backpack above. It has a number of good anti theft features such as hidden zippers, a hidden back pocket and side pocket for keeping your mobile and wallet safely stowed. It has one main compartment, with a number of small pockets and a separate padded sleeve for a large laptop up to 17″ and also a tablet. There is padding on the back and on the shoulder straps for extra comfort. Unfortunately there are no large side pockets for a water bottle. This minimalist anti theft bag opens 180 degrees so packing the bag is simple, as is going through airport security. There is a nice cross strap to hold your belongings tight when the bag is opened. The Kopack backpack has a capacity of around 20 liters so there is plenty of space to store your gear. 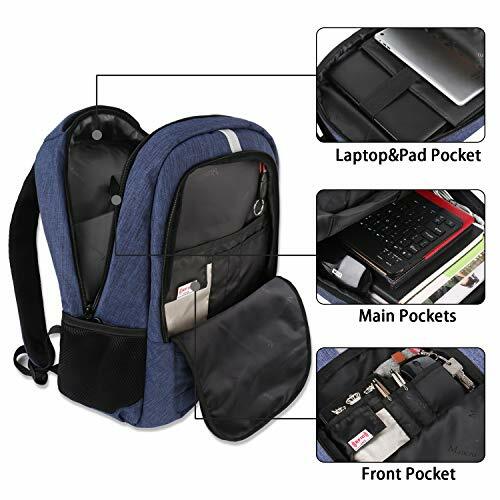 This pack is perfect for college students or business commuters but also a good choice for travelers who are looking for an affordable anti theft backpack. The Korin Design ClickPack Pro is an award winning locking travel backpack with a number of advanced anti theft features and a thoughtful design. Be aware of copies – there are many who have tried to copy the success of this travel safe bag. The ClickPack Pro has one main compartment that opens 180 degrees. Inside there are number of other zippered pockets and sections, including space for a 15.6″ laptop and tablet. A unique feature on this travel bag is that some of the internal pockets can be removed, which makes them useful for storing essential makeup or toiletries. What we love most about this anti theft bag is the retractable locking cable, integrated tsa approved lockable zippers and hidden external pockets. When you combine that with handy features such as a built in rain cover, external USB charging port and small hidden pockets on the straps, you see how practical this secure backpack is for travelers and commuters alike. A 17 liters it is large enough to fit the essentials without being bulky and heavy. 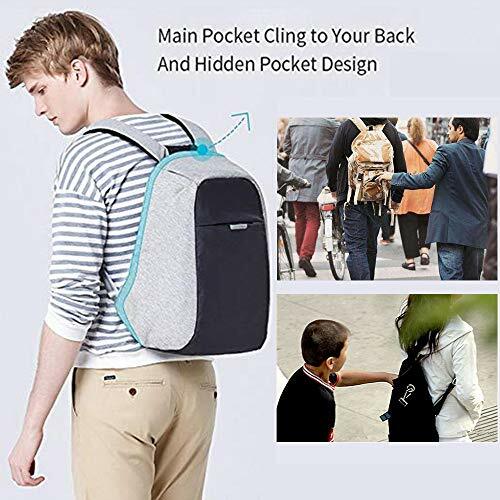 If you like the minimalist, modern look, but also want advanced anti-theft design, this anti theft backpack is a great choice. If you are looking for the best anti theft carry on luggage, the Pacsafe Venturesafe EXP45 is a great choice. At 45 liters it is the only anti theft convertible backpack on our list and is large enough to carry everything you need for a short trip (or even a longer trip to Europe if you pack light). It also meets most airline carry-on standards. This Pacsafe slash proof travel backpack is versatile and can be worn two ways – as a backpack, or as luggage with the straps tucked away. It has padded shoulder straps, hip belt for extra support, a large main compartment with book style opening for easy access to you clothes (with a strap to hold them in place) and a smaller front compartment with plenty of pockets for your small valuables. It has some useful design features for backpackers including a hold strap for storing your jacket or travel pillow and external compression straps to keep the bag compact. In terms of anti theft features this Pacsafe travel backpack has more than any other anti theft backpack Amazon has to offer. Stainless steel mesh within the fabric means it is a cut proof travel bag. It has puncture resistant lockable zippers and a locking cable to secure your bag. (Note a separate lock is required to actually lock the zips to the bar). Note there are also 55 Liter and 65 Liter options with the same features if you are looking for larger checked anti theft luggage. If you are looking for an anti theft backpack to fit all of your belongings for your next trip away, this is a good choice. Finally, the last product we recommend to purchase in conjunction with an anti-theft travel backpack is the Pacsafe Travelsafe Portable Safe. This product is great to leave in your hotel room with all the tech gear you don’t want to carry around with you during the day. Most hotel safes are not large enough to store laptops, kindles and other gear you may want to leave at the hotel. We own the 12l Portable safe and it easily fits a laptop, tablet, 2 kindles, 4 passports, 2 mobile phones and a DLSR camera. You can lock the bag up and head out to explore, unencumbered by the weight of your valuable tech gear. You can confident it is safely stored at the hotel. >> Click here to read more reviews. Use the anti-theft features of your bag. Lock the backpack compartments. This is the single most effective tip for how to prevent pickpocketing. Place valuables such as your wallet and passport inside a zippered internal pocket in a locked compartment of your backpack. Take only what you need out with you and lock the rest of your valuables in your hotel room in the pacsafe portable safe. A pickpocket can’t steal what you don’t carry with you. We will often lock away our passports, extra credit cards and tech gear in the Pacsafe portable safe when out sightseeing. Keep your wallet locked away and carry a small amount of cash and a single credit card in a front pocket for purchases. Always secure your bag when placing it down, such as in airports, on trains and in restaurants. This could be as simple as placing the strap around the leg of a chair, or locking it to a table. Don’t store your wallet or your smartphone in your back pocket – that is a prime target for pickpockets. Be aware of your surroundings, particularly at busy tourist attractions, on public transport, at night and in restaurants. Read the common pickpocket techniques below. Don’t leave your bag unattended. In busy markets or on crowded public transport, bring your backpack around and wear it on the front. Not so cool, but safe. Don’t sit your smartphone on the restaurant table or have it out when waiting for a train or bus. Keep DSLR cameras out of sight. When using them, use a cross body strap to secure them to your body. Here are some of the most common pickpocket techniques to be aware of when you travel or commute. Pickpockets will often work in groups, with one distracting you with a question or asking for directions. Meanwhile their partner is removing items from your bag. Bring your bag close and stay alert when helping others. Phones left on tables at outdoor tables in restaurants are a common target for pickpockets. Keep it out of sight. It isn’t common, but sometimes a pickpocket will slash your bag (or even your back pocket) without you noticing and remove items from your bag. Busy markets, street performances and crowded public transport are common places for this to occur. Bring your backpack to the front when in crowded places. In countries where luggage is stored under or on top of the bus, pickpockets have the opportunity to rifle through the bags at bus stops and stations. Do not store valuables in stowed luggage and ensure your luggage is locked. Also keep an eye on luggage being removed from the bus at each stop. This is one of the most common locations for pickpockets to work. Busy and crowded metro stations, museums, trains and bus stops are common places for thefts to occur. Be aware of your surroundings, secure your bags and ensure your travel bags are locked when traveling on public transport. Always hold them close to you. Pickpockets often offer to help with carrying luggage, buying tickets and giving directions. While you don’t want to suspect everyone who is helpful of being a pickpocket, be aware of your surroundings if you are offered help by a stranger. 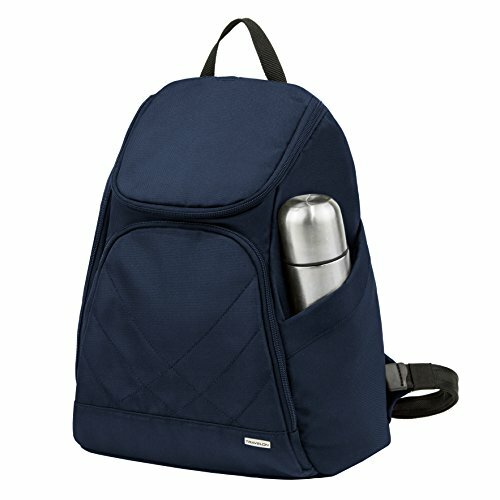 Are Anti Theft Backpacks Worth The Money? Theft proof luggage can cost more than a regular travel backpack, but losing your wallet, camera, or passport will cost a whole lot more. Plus who wants the hassle of trying to replace these items when you are on vacation? Having peace of mind that your belongings are safe in anti theft luggage is a small price to pay . You can also read our guide to essential travel accessories and other recommended travel gear here. Pin and Share to Pinterest!